Building a Facebook page for your business is a great way to engage with current and potential customers. It allows you to target specific audiences and advertise to them in a cost-efficient way. When done well, your page can even be used as a tool to build brand love for your business within the Facebook community. Wondering how you’d benefit from a Facebook page for your business? Here are a few key ways, for a start. A Facebook page serves as cost-effective exposure for your brand. It costs $0 to create a Facebook for Business page. Once created, the page acts as a hub for your brand, where users can learn about who you are, what you do, and what services you provide. A Facebook for Business page can make information like your hours, location, photos, and promotions easily accessible to customers, without spending anything up front. It’s a direct way to connect with current and potential customers. Your Facebook for Business page can help you create digital word of mouth. Managed well, your page acts as a forum for community growth and communication with new and loyal customers. It’s a space for you to connect with customers directly, answer their questions, and share offerings they’ll benefit from. If you’re looking for constructive notes from real people to make your business stronger, your Facebook page is a great place to address feedback directly and let customers know they’ve been heard. Plus, your published posts can help you grow your community by providing customers with content to share with Facebook friends how much they love your business. You can reach your target audience simply and efficiently. Yes, there are over a billion people on Facebook, but you don’t need to reach all of them — just those in your sweet spot. Facebook for Business gives you the ability to choose specific audiences to reach with your boosted posts by their geographic location, age, interests, and more. For example, if you’ve just opened a new yoga studio, you could boost a post from your page to reach men and women aged 20 to 65 years old who live within a 20-mile radius of your studio. You can reach them for an efficient cost — likely $20 to $50 for several days of exposure. For more information on how much to spend and how to measure your efficiency, check out Facebook’s Budgeting FAQ and fundamentals. It allows you to have a mobile-optimized experience. Whether you have an eCommerce business or a brick-and-mortar store, there are endless benefits to mobile-first capabilities. Your Facebook page will house important business information for potential customers on their mobile devices. If you have an online store, Facebook gives you the tools to create multiple opportunities for “Shop Now” or “Learn More” to drive to your site and allow users to purchase directly. Since over half of Americans have successfully made purchases on their mobile devices, creating a gateway to make a purchase through your Facebook page is a no-brainer. The benefits for brick-and-mortar stores are clear, too. According to Google, mobile searches for “can I/to buy” plus “near me” have expanded by more than 500 percent, which means you have the perfect opportunity to be the place they’re looking for. Your page gives you the tools to easily test and try new branded content and messaging. Whether it’s gathering results from an ad on a billboard, a flier, or social media ads, figuring out if your message is resonating with your audience can be a challenge. Your Facebook page can act as a tool to do this swiftly by testing new concepts with your community (by utilizing organic published posts on your page that you can boost to ensure they’re seen by a wider audience) or potential customers (with Facebook ads to your target audience). By A/B testing and comparing metrics on the amount of post engagement, site visits, and more, this feedback can help you make educated decisions when it comes to the more expensive advertising channels. Square Marketing and Facebook Insights allow you to see what’s working — and what’s not. Using Square Marketing, you can determine attributable sales, coupon redemptions, and engagement metrics from your Facebook campaigns. Also, a Facebook post published through Square Marketing is shown to customers who have made a purchase from your business, even if they haven’t followed or liked your page. 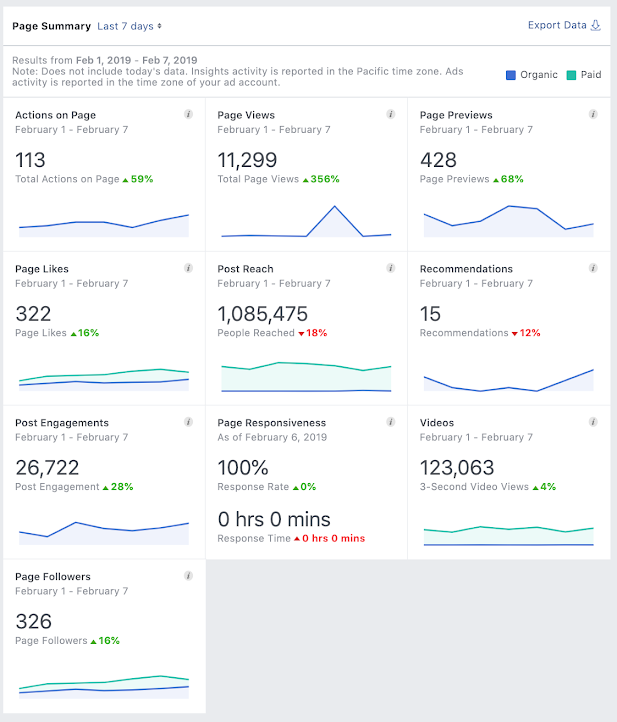 Facebook’s Insights tool gives you a transparent view into the details of how many people you’re reaching, how many are engaging with your posts, how many are following your page, and what percentage of all of these stats have been earned with organic versus paid and “boosted” content. Below is a sample of a one-week results roundup from Insights compared to the previous week. All of it — and then some — is readily available in your Facebook dashboard in detail.